Healthy Coffee Frappuccino was posted on August 12th, 2011 and is filed under Dairy Free, Drinks & Smoothies, Gluten Free, Life, Low Carb, Recipes, Vegan. This entry has 20 comments. You can follow any responses through the RSS 2.0 Comment Feed. Some posts are worth the wait. I have discovered the best coffee ever. I’m so excited about it…I don’t know why I didn’t think of it sooner! I have a confession…I love those frilly-topped-with-whipped-cream coffee “fru-fru” drinks (so I call them). You know, those beautiful concoctions at Starbucks that are loaded with sugar and whipped cream and taste kind of…out of this world. And I love the more simple coffee frappuccinos. Sweet and ice cold with the foamy milk on top. I could have them every day. So…now I am. It’s a lovely ritual. It’s all rather happy, because I made a healthy version that is less than 50 calories and has no sugar! How’s that?! Blend until it becomes the frothy, cold goodness it’s supposed to. I garnished mine with a little organic hot chocolate powder. Serves 1. Here’s a few photos of our family time. With almost all the nieces and nephews here, there were 16 of them running around. They have such fun together! 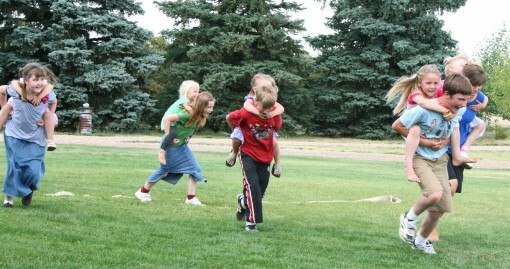 We had a bunch of races and games planned the one afternoon which all the kids loved. One of my nieces. I love this photo. Another one of my beautiful nieces. The girls totally rawk out the boys in this family. I only have 6 nephews out of the 18! 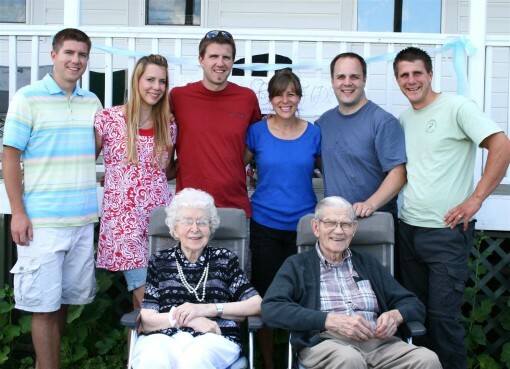 These are my grandparents and all my siblings (except for one sister who couldn’t make it out!). It was my Grandma’s 90th birthday so we all got together and had a party! (Doesn’t she look amazing for 90?! And she has hardly any wrinkles!) I’m so blessed to have the family I do…God has been so gracious to us. Do you like fancy coffee drinks? What’s your favourite coffee beverage? At the camp I volunteer at we had a less healthy version of the coffe frappuccino. I prefer yours! Thanks. Exactly what I’ve been craving. I like this better than starbucks. I’m having this today! Great! a healthy frap. this will certainly be another one in the making for me. It looks like your family had a great time! We have 16 nieces and nephews as well and it makes for a crazy crowd during the holidays. It is always fun though. No coffee drinks for me. It’s been years since I had one and honestly, I wasn’t a big fan then. Coffee has just never been my thing. I’m married to a coffee man though and it’s plain black coffee for him every morning. I do LOVE the aroma! Looks delicious! 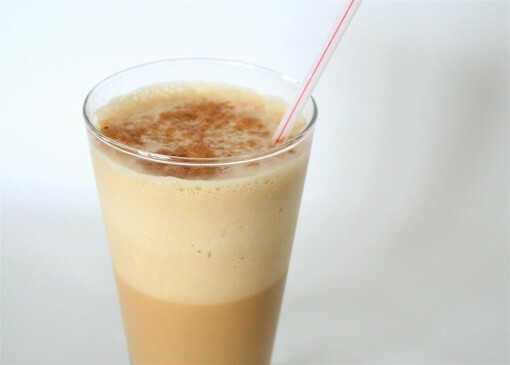 I drink ice coffee every morning, but I like the thought of glamming it up in a healthy way! I just found your blog and I really like it- I can’t wait to look around some more! Such a lovely drink! And the kids are adorable! I love making coffee drinks like this at home — they’re so much healthier! This one looks really delicious. 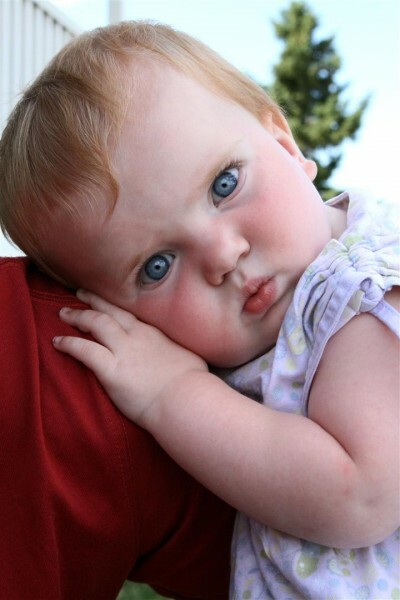 And awww, such cute family pics…I love that pic of your niece resting her head — too cute! Coffee drinks are truly something I crave for! The picture here is extremely tempting. Your nieces are so cute and you are a beauty! Hmmm, had this on Saturday as I baked and cleaned, Chris. Well, a version of it! Loved the foamy-ness! I will definatly try! And do u have to use almond milk? Madelyn~ No, you can use any milk you want…nut milk or regular milk, I just prefer almond milk because it’s dairy-free and lower cal. I’ve made this, but never blended it…does it keep the almond milk from separating?